11 F None No Power Seat 11 F is a standard Business Class seat that transforms into a fully-flat bed. The seat is located at a bulkhead. The proximity to the galley and lavatory area might be bothersome. This seat and the one adjacent are ideal for a couple traveling together. 12 K None No Power Seat 12 K is a standard Business Class seat that transforms into a fully-flat bed. 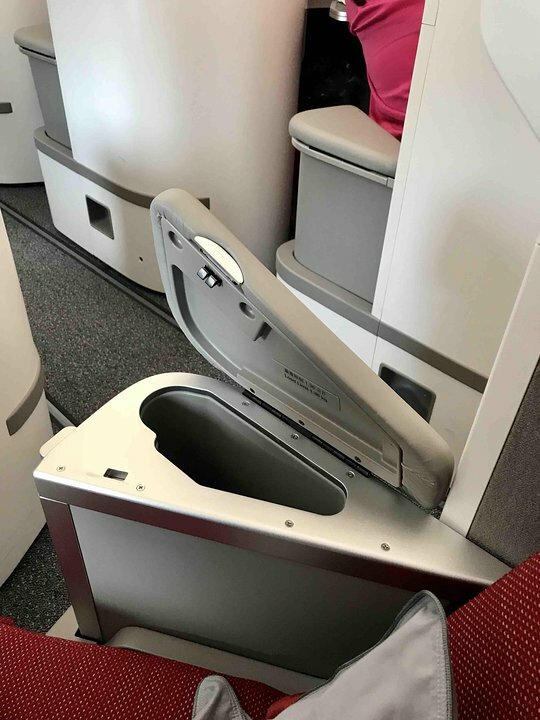 The seat is located at a bulkhead and provides an added sense of privacy. 20 A None No Power Seat 20 A is a standard Business Class seat that transforms into a fully-flat bed. The proximity to the galley area might be bothersome. 20 D None No Power Seat 20 D is a standard Business Class seat that transforms into a fully-flat bed. 20 G None No Power Seat 20 G is a standard Business Class seat that transforms into a fully-flat bed. 20 K None No Power Seat 20 K is a standard Business Class seat that transforms into a fully-flat bed. The proximity to the galley area might be bothersome. 21 E None No Power Seat 21 E is a standard Business Class seat that transforms into a fully-flat bed. The proximity to the galley area might be bothersome. This seat and the one adjacent are ideal for a couple traveling together. 21 F None No Power Seat 21 F is a standard Business Class seat that transforms into a fully-flat bed. The proximity to the galley area might be bothersome. This seat and the one adjacent are ideal for a couple traveling together. 31 A None No Power Seat 31 A is a standard Economy Class seat with extra, although stretch restrictive, legroom due to the location at a bulkhead. The tray table and inflight entertainment monitor are installed in a fixed armrest, therefore, seat width is slightly reduced. Floor storage for personal items is not available for use during takeoff and landing. The proximity to the galley area might be bothersome. A bassinet might be installed on the bulkhead, therefore, a passenger traveling with an infant might be seated in this row. The seat is classified as an "Extra Legroom Seat" and may be selected for an additional fee. 31 B None No Power Seat 31 B is a standard Economy Class seat with extra, although stretch restrictive, legroom due to the location at a bulkhead. 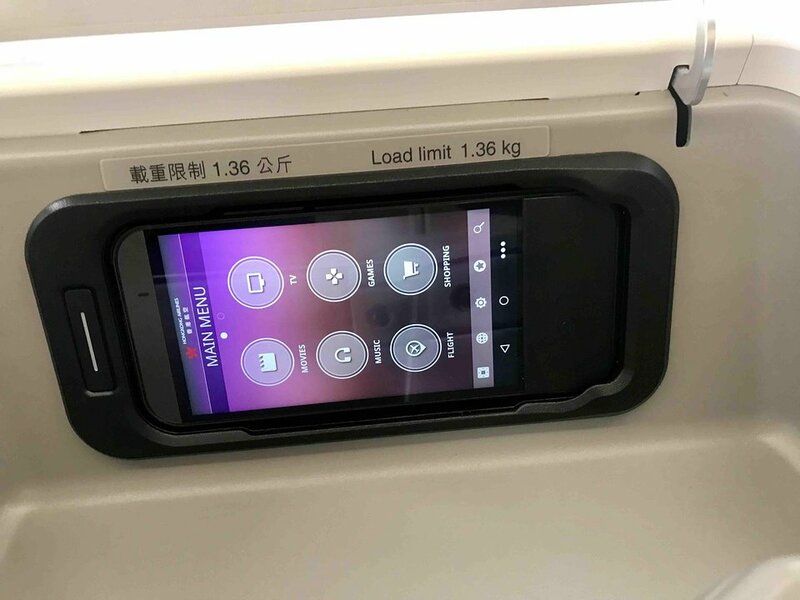 The tray table and inflight entertainment monitor are installed in a fixed armrest, therefore, seat width is slightly reduced. Floor storage for personal items is not available for use during takeoff and landing. The proximity to the galley area might be bothersome. A bassinet might be installed on the bulkhead, therefore, a passenger traveling with an infant might be seated in this row. The seat is classified as an "Extra Legroom Seat" and may be selected for an additional fee. 31 C None No Power Seat 31 C is a standard Economy Class seat with extra, although stretch restrictive, legroom due to the location at a bulkhead. The tray table and inflight entertainment monitor are installed in a fixed armrest, therefore, seat width is slightly reduced. Floor storage for personal items is not available for use during takeoff and landing. The proximity to the galley area might be bothersome. A bassinet might be installed on the bulkhead, therefore, a passenger traveling with an infant might be seated in this row. The seat is classified as an "Extra Legroom Seat" and may be selected for an additional fee. 31 D None No Power Seat 31 D is a standard Economy Class seat with extra, although stretch restrictive, legroom due to the location at a bulkhead. The tray table and inflight entertainment monitor are installed in a fixed armrest, therefore, seat width is slightly reduced. Floor storage for personal items is not available for use during takeoff and landing. The proximity to the galley area might be bothersome. A bassinet might be installed on the bulkhead, therefore, a passenger traveling with an infant might be seated in this row. The seat is classified as an "Extra Legroom Seat" and may be selected for an additional fee. 31 E None No Power Seat 31 E is a standard Economy Class seat with extra, although stretch restrictive, legroom due to the location at a bulkhead. The tray table and inflight entertainment monitor are installed in a fixed armrest, therefore, seat width is slightly reduced. Floor storage for personal items is not available for use during takeoff and landing. The proximity to the galley area might be bothersome. A bassinet might be installed on the bulkhead, therefore, a passenger traveling with an infant might be seated in this row. The seat is classified as an "Extra Legroom Seat" and may be selected for an additional fee. 31 G None No Power Seat 31 G is a standard Economy Class seat with extra, although stretch restrictive, legroom due to the location at a bulkhead. The tray table and inflight entertainment monitor are installed in a fixed armrest, therefore, seat width is slightly reduced. Floor storage for personal items is not available for use during takeoff and landing. The proximity to the galley area might be bothersome. A bassinet might be installed on the bulkhead, therefore, a passenger traveling with an infant might be seated in this row. The seat is classified as an "Extra Legroom Seat" and may be selected for an additional fee. 31 H None No Power Seat 31 H is a standard Economy Class seat with extra, although stretch restrictive, legroom due to the location at a bulkhead. The tray table and inflight entertainment monitor are installed in a fixed armrest, therefore, seat width is slightly reduced. Floor storage for personal items is not available for use during takeoff and landing. The proximity to the galley area might be bothersome. A bassinet might be installed on the bulkhead, therefore, a passenger traveling with an infant might be seated in this row. The seat is classified as an "Extra Legroom Seat" and may be selected for an additional fee. 31 J None No Power Seat 31 J is a standard Economy Class seat with extra, although stretch restrictive, legroom due to the location at a bulkhead. The tray table and inflight entertainment monitor are installed in a fixed armrest, therefore, seat width is slightly reduced. Floor storage for personal items is not available for use during takeoff and landing. The proximity to the galley area might be bothersome. A bassinet might be installed on the bulkhead, therefore, a passenger traveling with an infant might be seated in this row. The seat is classified as an "Extra Legroom Seat" and may be selected for an additional fee. 31 K None No Power Seat 31 K is a standard Economy Class seat with extra, although stretch restrictive, legroom due to the location at a bulkhead. The tray table and inflight entertainment monitor are installed in a fixed armrest, therefore, seat width is slightly reduced. Floor storage for personal items is not available for use during takeoff and landing. The proximity to the galley area might be bothersome. A bassinet might be installed on the bulkhead, therefore, a passenger traveling with an infant might be seated in this row. The seat is classified as an "Extra Legroom Seat" and may be selected for an additional fee. 32 H None No Power Seat 32 H is a standard Economy Class seat in a section named Economy Comfort. The seat offers 3 additional inches of legroom and may be selected for an additional fee. 32 J None No Power Seat 32 J is a standard Economy Class seat in a section named Economy Comfort. The seat offers 3 additional inches of legroom and may be selected for an additional fee. 32 K None No Power Seat 32 K is a standard Economy Class seat in a section named Economy Comfort. The seat offers 3 additional inches of legroom and may be selected for an additional fee. 33 A None No Power Seat 33 A is a standard Economy Class seat in a section named Economy Comfort. The seat offers 3 additional inches of legroom and may be selected for an additional fee. 33 B None No Power Seat 33 B is a standard Economy Class seat in a section named Economy Comfort. The seat offers 3 additional inches of legroom and may be selected for an additional fee. 33 C None No Power Seat 33 C is a standard Economy Class seat in a section named Economy Comfort. The seat offers 3 additional inches of legroom and may be selected for an additional fee. 33 D None No Power Seat 33 D is a standard Economy Class seat in a section named Economy Comfort. The seat offers 3 additional inches of legroom and may be selected for an additional fee. 33 E None No Power Seat 33 E is a standard Economy Class seat in a section named Economy Comfort. The seat offers 3 additional inches of legroom and may be selected for an additional fee. 33 G None No Power Seat 33 G is a standard Economy Class seat in a section named Economy Comfort. The seat offers 3 additional inches of legroom and may be selected for an additional fee. 33 H None No Power Seat 33 H is a standard Economy Class seat in a section named Economy Comfort. The seat offers 3 additional inches of legroom and may be selected for an additional fee. 33 J None No Power Seat 33 J is a standard Economy Class seat in a section named Economy Comfort. The seat offers 3 additional inches of legroom and may be selected for an additional fee. 33 K None No Power Seat 33 K is a standard Economy Class seat in a section named Economy Comfort. The seat offers 3 additional inches of legroom and may be selected for an additional fee. 34 A None No Power Seat 34 A is a standard Economy Class seat in a section named Economy Comfort. The seat offers 3 additional inches of legroom and may be selected for an additional fee. 34 B None No Power Seat 34 B is a standard Economy Class seat in a section named Economy Comfort. The seat offers 3 additional inches of legroom and may be selected for an additional fee. 34 C None No Power Seat 34 C is a standard Economy Class seat in a section named Economy Comfort. The seat offers 3 additional inches of legroom and may be selected for an additional fee. 34 D None No Power Seat 34 D is a standard Economy Class seat in a section named Economy Comfort. The seat offers 3 additional inches of legroom and may be selected for an additional fee. 34 E None No Power Seat 34 E is a standard Economy Class seat in a section named Economy Comfort. The seat offers 3 additional inches of legroom and may be selected for an additional fee. 34 G None No Power Seat 34 G is a standard Economy Class seat in a section named Economy Comfort. The seat offers 3 additional inches of legroom and may be selected for an additional fee. 34 H None No Power Seat 34 H is a standard Economy Class seat in a section named Economy Comfort. The seat offers 3 additional inches of legroom and may be selected for an additional fee. 34 J None No Power Seat 34 J is a standard Economy Class seat in a section named Economy Comfort. The seat offers 3 additional inches of legroom and may be selected for an additional fee. 34 K None No Power Seat 34 K is a standard Economy Class seat in a section named Economy Comfort. The seat offers 3 additional inches of legroom and may be selected for an additional fee. 35 A None No Power Seat 35 A is a standard Economy Class seat in a section named Economy Comfort. The seat offers 3 additional inches of legroom and may be selected for an additional fee. 35 B None No Power Seat 35 B is a standard Economy Class seat in a section named Economy Comfort. The seat offers 3 additional inches of legroom and may be selected for an additional fee. 35 C None No Power Seat 35 C is a standard Economy Class seat in a section named Economy Comfort. The seat offers 3 additional inches of legroom and may be selected for an additional fee. 35 D None No Power Seat 35 D is a standard Economy Class seat in a section named Economy Comfort. The seat offers 3 additional inches of legroom and may be selected for an additional fee. 35 E None No Power Seat 35 E is a standard Economy Class seat in a section named Economy Comfort. The seat offers 3 additional inches of legroom and may be selected for an additional fee. 35 G None No Power Seat 35 G is a standard Economy Class seat in a section named Economy Comfort. The seat offers 3 additional inches of legroom and may be selected for an additional fee. 35 H None No Power Seat 35 H is a standard Economy Class seat in a section named Economy Comfort. The seat offers 3 additional inches of legroom and may be selected for an additional fee. 35 J None No Power Seat 35 J is a standard Economy Class seat in a section named Economy Comfort. The seat offers 3 additional inches of legroom and may be selected for an additional fee. 35 K None No Power Seat 35 K is a standard Economy Class seat in a section named Economy Comfort. The seat offers 3 additional inches of legroom and may be selected for an additional fee. 36 A None No Power Seat 36 A is a standard Economy Class seat in a section named Economy Comfort. The seat offers 3 additional inches of legroom and may be selected for an additional fee. 36 B None No Power Seat 36 B is a standard Economy Class seat in a section named Economy Comfort. The seat offers 3 additional inches of legroom and may be selected for an additional fee. 36 C None No Power Seat 36 C is a standard Economy Class seat in a section named Economy Comfort. The seat offers 3 additional inches of legroom and may be selected for an additional fee. 36 D None No Power Seat 36 D is a standard Economy Class seat in a section named Economy Comfort. The seat offers 3 additional inches of legroom and may be selected for an additional fee. 36 E None No Power Seat 36 E is a standard Economy Class seat in a section named Economy Comfort. The seat offers 3 additional inches of legroom and may be selected for an additional fee. 36 G None No Power Seat 36 G is a standard Economy Class seat in a section named Economy Comfort. The seat offers 3 additional inches of legroom and may be selected for an additional fee. 36 H None No Power Seat 36 H is a standard Economy Class seat in a section named Economy Comfort. The seat offers 3 additional inches of legroom and may be selected for an additional fee. 36 J None No Power Seat 36 J is a standard Economy Class seat in a section named Economy Comfort. The seat offers 3 additional inches of legroom and may be selected for an additional fee. 36 K None No Power Seat 36 K is a standard Economy Class seat in a section named Economy Comfort. The seat offers 3 additional inches of legroom and may be selected for an additional fee. 37 A None No Power Seat 37 A is a standard Economy Class seat in a section named Economy Comfort. The seat offers 3 additional inches of legroom and may be selected for an additional fee. 37 B None No Power Seat 37 B is a standard Economy Class seat in a section named Economy Comfort. The seat offers 3 additional inches of legroom and may be selected for an additional fee. 37 C None No Power Seat 37 C is a standard Economy Class seat in a section named Economy Comfort. The seat offers 3 additional inches of legroom and may be selected for an additional fee. 37 D None No Power Seat 37 D is a standard Economy Class seat in a section named Economy Comfort. The seat offers 3 additional inches of legroom and may be selected for an additional fee. 37 E None No Power Seat 37 E is a standard Economy Class seat in a section named Economy Comfort. The seat offers 3 additional inches of legroom and may be selected for an additional fee. 37 G None No Power Seat 37 G is a standard Economy Class seat in a section named Economy Comfort. The seat offers 3 additional inches of legroom and may be selected for an additional fee. 37 H None No Power Seat 37 H is a standard Economy Class seat in a section named Economy Comfort. The seat offers 3 additional inches of legroom and may be selected for an additional fee. 37 J None No Power Seat 37 J is a standard Economy Class seat in a section named Economy Comfort. The seat offers 3 additional inches of legroom and may be selected for an additional fee. 37 K None No Power Seat 37 K is a standard Economy Class seat in a section named Economy Comfort. The seat offers 3 additional inches of legroom and may be selected for an additional fee. 38 A None No Power Seat 38 A is a standard Economy Class seat in a section named Economy Comfort. The seat offers 3 additional inches of legroom and may be selected for an additional fee. 38 B None No Power Seat 38 B is a standard Economy Class seat in a section named Economy Comfort. The seat offers 3 additional inches of legroom and may be selected for an additional fee. 38 C None No Power Seat 38 C is a standard Economy Class seat in a section named Economy Comfort. The seat offers 3 additional inches of legroom and may be selected for an additional fee. 38 D None No Power Seat 38 D is a standard Economy Class seat in a section named Economy Comfort. The seat offers 3 additional inches of legroom and may be selected for an additional fee. 38 E None No Power Seat 38 E is a standard Economy Class seat in a section named Economy Comfort. The seat offers 3 additional inches of legroom and may be selected for an additional fee. 38 G None No Power Seat 38 G is a standard Economy Class seat in a section named Economy Comfort. The seat offers 3 additional inches of legroom and may be selected for an additional fee. 38 H None No Power Seat 38 H is a standard Economy Class seat in a section named Economy Comfort. The seat offers 3 additional inches of legroom and may be selected for an additional fee. 38 J None No Power Seat 38 J is a standard Economy Class seat in a section named Economy Comfort. The seat offers 3 additional inches of legroom and may be selected for an additional fee. 38 K None No Power Seat 38 K is a standard Economy Class seat in a section named Economy Comfort. The seat offers 3 additional inches of legroom and may be selected for an additional fee. 39 A None No Power Seat 39 A is a standard Economy Class seat in a section named Economy Comfort. The seat offers 3 additional inches of legroom and may be selected for an additional fee. 39 B None No Power Seat 39 B is a standard Economy Class seat in a section named Economy Comfort. The seat offers 3 additional inches of legroom and may be selected for an additional fee. 39 C None No Power Seat 39 C is a standard Economy Class seat in a section named Economy Comfort. The seat offers 3 additional inches of legroom and may be selected for an additional fee. 39 D None No Power Seat 39 D is a standard Economy Class seat in a section named Economy Comfort. The seat offers 3 additional inches of legroom and may be selected for an additional fee. 39 E None No Power Seat 39 E is a standard Economy Class seat in a section named Economy Comfort. The seat offers 3 additional inches of legroom and may be selected for an additional fee. 39 G None No Power Seat 39 G is a standard Economy Class seat in a section named Economy Comfort. The seat offers 3 additional inches of legroom and may be selected for an additional fee. 39 H None No Power Seat 39 H is a standard Economy Class seat in a section named Economy Comfort. The seat offers 3 additional inches of legroom and may be selected for an additional fee. 39 J None No Power Seat 39 J is a standard Economy Class seat in a section named Economy Comfort. The seat offers 3 additional inches of legroom and may be selected for an additional fee. 39 K None No Power Seat 39 K is a standard Economy Class seat in a section named Economy Comfort. The seat offers 3 additional inches of legroom and may be selected for an additional fee. 40 A None No Power Seat 40 A is a standard Economy Class seat in a section named Economy Comfort. The seat offers 3 additional inches of legroom and may be selected for an additional fee. 40 B None No Power Seat 40 B is a standard Economy Class seat in a section named Economy Comfort. The seat offers 3 additional inches of legroom and may be selected for an additional fee. 40 C None No Power Seat 40 C is a standard Economy Class seat in a section named Economy Comfort. The seat offers 3 additional inches of legroom and may be selected for an additional fee. 40 D None No Power Seat 40 D is a standard Economy Class seat in a section named Economy Comfort. The seat offers 3 additional inches of legroom and may be selected for an additional fee. 40 E None No Power Seat 40 E is a standard Economy Class seat in a section named Economy Comfort. The seat offers 3 additional inches of legroom and may be selected for an additional fee. 40 G None No Power Seat 40 G is a standard Economy Class seat in a section named Economy Comfort. The seat offers 3 additional inches of legroom and may be selected for an additional fee. 40 H None No Power Seat 40 H is a standard Economy Class seat in a section named Economy Comfort. The seat offers 3 additional inches of legroom and may be selected for an additional fee. 40 J None No Power Seat 40 J is a standard Economy Class seat in a section named Economy Comfort. The seat offers 3 additional inches of legroom and may be selected for an additional fee. 40 K None No Power Seat 40 K is a standard Economy Class seat in a section named Economy Comfort. The seat offers 3 additional inches of legroom and may be selected for an additional fee. 41 A None No Power Seat 41 A is a standard Economy Class seat in a section named Economy Comfort. The seat offers 3 additional inches of legroom and may be selected for an additional fee. 41 B None No Power Seat 41 B is a standard Economy Class seat in a section named Economy Comfort. The seat offers 3 additional inches of legroom and may be selected for an additional fee. 41 C None No Power Seat 41 C is a standard Economy Class seat in a section named Economy Comfort. The seat offers 3 additional inches of legroom and may be selected for an additional fee. 41 D None No Power Seat 41 D is a standard Economy Class seat in a section named Economy Comfort. The seat offers 3 additional inches of legroom and may be selected for an additional fee. 41 E None No Power Seat 41 E is a standard Economy Class seat in a section named Economy Comfort. The seat offers 3 additional inches of legroom and may be selected for an additional fee. 41 G None No Power Seat 41 G is a standard Economy Class seat in a section named Economy Comfort. The seat offers 3 additional inches of legroom and may be selected for an additional fee. 41 H None No Power Seat 41 H is a standard Economy Class seat in a section named Economy Comfort. The seat offers 3 additional inches of legroom and may be selected for an additional fee. 41 J None No Power Seat 41 J is a standard Economy Class seat in a section named Economy Comfort. The seat offers 3 additional inches of legroom and may be selected for an additional fee. 41 K None No Power Seat 41 K is a standard Economy Class seat in a section named Economy Comfort. The seat offers 3 additional inches of legroom and may be selected for an additional fee. 42 A None No Power Seat 42 A is a standard Economy Class seat in a section named Economy Comfort. The seat offers 3 additional inches of legroom and may be selected for an additional fee. 42 B None No Power Seat 42 B is a standard Economy Class seat in a section named Economy Comfort. The seat offers 3 additional inches of legroom and may be selected for an additional fee. 42 C None No Power Seat 42 C is a standard Economy Class seat in a section named Economy Comfort. The seat offers 3 additional inches of legroom and may be selected for an additional fee. 42 D None No Power Seat 42 D is a standard Economy Class seat in a section named Economy Comfort. The seat offers 3 additional inches of legroom and may be selected for an additional fee. 42 E None No Power Seat 42 E is a standard Economy Class seat in a section named Economy Comfort. The seat offers 3 additional inches of legroom and may be selected for an additional fee. 42 G None No Power Seat 42 G is a standard Economy Class seat in a section named Economy Comfort. The seat offers 3 additional inches of legroom and may be selected for an additional fee. 42 H None No Power Seat 42 H is a standard Economy Class seat in a section named Economy Comfort. The seat offers 3 additional inches of legroom and may be selected for an additional fee. 42 J None No Power Seat 42 J is a standard Economy Class seat in a section named Economy Comfort. The seat offers 3 additional inches of legroom and may be selected for an additional fee. 42 K None No Power Seat 42 K is a standard Economy Class seat in a section named Economy Comfort. The seat offers 3 additional inches of legroom and may be selected for an additional fee. 43 A None No Power Seat 43 A is a standard Economy Class seat in a section named Economy Comfort. The seat offers 3 additional inches of legroom and may be selected for an additional fee. 43 B None No Power Seat 43 B is a standard Economy Class seat in a section named Economy Comfort. The seat offers 3 additional inches of legroom and may be selected for an additional fee. 43 C None No Power Seat 43 C is a standard Economy Class seat in a section named Economy Comfort. The seat offers 3 additional inches of legroom and may be selected for an additional fee. 43 D None No Power Seat 43 D is a standard Economy Class seat in a section named Economy Comfort. The seat offers 3 additional inches of legroom and may be selected for an additional fee. 43 E None No Power Seat 43 E is a standard Economy Class seat in a section named Economy Comfort. The seat offers 3 additional inches of legroom and may be selected for an additional fee. 43 G None No Power Seat 43 G is a standard Economy Class seat in a section named Economy Comfort. The seat offers 3 additional inches of legroom and may be selected for an additional fee. 43 H None No Power Seat 43 H is a standard Economy Class seat in a section named Economy Comfort. The seat offers 3 additional inches of legroom and may be selected for an additional fee. 43 J None No Power Seat 43 J is a standard Economy Class seat in a section named Economy Comfort. The seat offers 3 additional inches of legroom and may be selected for an additional fee. 43 K None No Power Seat 43 K is a standard Economy Class seat in a section named Economy Comfort. The seat offers 3 additional inches of legroom and may be selected for an additional fee. 49 A None No Power Seat 49 A is a standard Economy Class seat located in the last row of the forward Economy Class cabin. Seat back recline might be limited due to the wall of the lavatory directly behind. Also, if the seat back in front is reclined, then personal space will be reduced. The proximity to the lavatory area might be bothersome. 49 B None No Power Seat 49 B is a standard Economy Class seat located in the last row of the forward Economy Class cabin. Seat back recline might be limited due to the wall of the lavatory directly behind. Also, if the seat back in front is reclined, then personal space will be reduced. The proximity to the lavatory area might be bothersome. 49 C None No Power Seat 49 C is a standard Economy Class seat located in the last row of the forward Economy Class cabin. Seat back recline might be limited due to the wall of the lavatory directly behind. Also, if the seat back in front is reclined, then personal space will be reduced. The proximity to the lavatory area might be bothersome. 49 D None No Power Seat 49 D is a standard Economy Class seat located in the last row of the forward Economy Class cabin. Seat back recline might be limited due to the wall of the lavatory directly behind. Also, if the seat back in front is reclined, then personal space will be reduced. The proximity to the lavatory area might be bothersome. 49 E None No Power Seat 49 E is a standard Economy Class seat located in the last row of the forward Economy Class cabin. Seat back recline might be limited due to the wall of the lavatory directly behind. Also, if the seat back in front is reclined, then personal space will be reduced. The proximity to the lavatory area might be bothersome. 49 G None No Power Seat 49 G is a standard Economy Class seat located in the last row of the forward Economy Class cabin. Seat back recline might be limited due to the wall of the lavatory directly behind. Also, if the seat back in front is reclined, then personal space will be reduced. The proximity to the lavatory area might be bothersome. 49 H None No Power Seat 49 H is a standard Economy Class seat located in the last row of the forward Economy Class cabin. Seat back recline might be limited due to the wall of the lavatory directly behind. Also, if the seat back in front is reclined, then personal space will be reduced. The proximity to the lavatory area might be bothersome. 49 J None No Power Seat 49 J is a standard Economy Class seat located in the last row of the forward Economy Class cabin. Seat back recline might be limited due to the wall of the lavatory directly behind. Also, if the seat back in front is reclined, then personal space will be reduced. The proximity to the lavatory area might be bothersome. 49 K None No Power Seat 49 K is a standard Economy Class seat located in the last row of the forward Economy Class cabin. Seat back recline might be limited due to the wall of the lavatory directly behind. Also, if the seat back in front is reclined, then personal space will be reduced. The proximity to the lavatory area might be bothersome. 51 B None No Power Seat 51 B is a standard Economy Class seat located in an Exit Row. There is additional legroom and additional personal space due to the lack of a seat directly ahead. The tray table and inflight entertainment monitor are installed in a fixed armrest, therefore, seat width is slightly reduced. Floor storage for personal items is not available for use during takeoff and landing. The proximity to the lavatory area might be bothersome. The seat is classified as an "Extra Legroom Seat" and may be selected for an additional fee. 51 C None No Power Seat 51 C is a standard Economy Class seat located in an Exit Row. There is additional legroom and additional personal space due to the lack of a seat directly ahead. The tray table and inflight entertainment monitor are installed in a fixed armrest, therefore, seat width is slightly reduced. Floor storage for personal items is not available for use during takeoff and landing. The proximity to the lavatory area might be bothersome. The seat is classified as an "Extra Legroom Seat" and may be selected for an additional fee. 51 D None No Power Seat 51 D is a standard Economy Class seat with extra legroom due to the location at a bulkhead. The tray table and inflight entertainment monitor are installed in a fixed armrest, therefore, seat width is slightly reduced. Floor storage for personal items is not available for use during takeoff and landing. The proximity to the lavatory area might be bothersome. A bassinet might be installed on the bulkhead, therefore, a passenger traveling with an infant might be seated in this row. The seat is classified as an "Extra Legroom Seat" and may be selected for an additional fee. 51 E None No Power Seat 51 E is a standard Economy Class seat with extra legroom due to the location at a bulkhead. The tray table and inflight entertainment monitor are installed in a fixed armrest, therefore, seat width is slightly reduced. Floor storage for personal items is not available for use during takeoff and landing. The proximity to the lavatory area might be bothersome. A bassinet might be installed on the bulkhead, therefore, a passenger traveling with an infant might be seated in this row. The seat is classified as an "Extra Legroom Seat" and may be selected for an additional fee. 51 G None No Power Seat 51 G is a standard Economy Class seat with extra legroom due to the location at a bulkhead. The tray table and inflight entertainment monitor are installed in a fixed armrest, therefore, seat width is slightly reduced. Floor storage for personal items is not available for use during takeoff and landing. The proximity to the lavatory area might be bothersome. A bassinet might be installed on the bulkhead, therefore, a passenger traveling with an infant might be seated in this row. The seat is classified as an "Extra Legroom Seat" and may be selected for an additional fee. 51 H None No Power Seat 51 H is a standard Economy Class seat located in an Exit Row. There is additional legroom and additional personal space due to the lack of a seat directly ahead. The tray table and inflight entertainment monitor are installed in a fixed armrest, therefore, seat width is slightly reduced. Floor storage for personal items is not available for use during takeoff and landing. The proximity to the lavatory area might be bothersome. The seat is classified as an "Extra Legroom Seat" and may be selected for an additional fee. 51 J None No Power Seat 51 J is a standard Economy Class seat located in an Exit Row. There is additional legroom and additional personal space due to the lack of a seat directly ahead. The tray table and inflight entertainment monitor are installed in a fixed armrest, therefore, seat width is slightly reduced. Floor storage for personal items is not available for use during takeoff and landing. The proximity to the lavatory area might be bothersome. The seat is classified as an "Extra Legroom Seat" and may be selected for an additional fee. 52 A None No Power Seat 52 A is a standard Economy Class seat with additional legroom due to the lack of a seat directly ahead. The tray table and inflight entertainment monitor are installed in a fixed armrest, therefore, seat width is slightly reduced. Floor storage for personal items is not available for use during takeoff and landing. The seat is classified as an "Extra Legroom Seat" and may be selected for an additional fee. 52 K None No Power Seat 52 K is a standard Economy Class seat with additional legroom due to the lack of a seat directly ahead. The tray table and inflight entertainment monitor are installed in a fixed armrest, therefore, seat width is slightly reduced. Floor storage for personal items is not available for use during takeoff and landing. The seat is classified as an "Extra Legroom Seat" and may be selected for an additional fee. 65 A None No Power Seat 65 A is a standard Economy Class seat located in a last row of the aircraft. Seat back recline might be limited due to the wall of the lavatory directly behind. Also, if the seat back in front is reclined, then personal space will be reduced. The proximity to the galley and lavatory area might be bothersome. 65 B None No Power Seat 65 B is a standard Economy Class seat located in a last row of the aircraft. Seat back recline might be limited due to the wall of the lavatory directly behind. Also, if the seat back in front is reclined, then personal space will be reduced. The proximity to the galley and lavatory area might be bothersome. 65 C None No Power Seat 65 C is a standard Economy Class seat located in a last row of the aircraft. Seat back recline might be limited due to the wall of the lavatory directly behind. Also, if the seat back in front is reclined, then personal space will be reduced. The proximity to the galley and lavatory area might be bothersome. 65 D None No Power Seat 65 D is a standard Economy Class seat. The proximity to the galley and lavatory area might be bothersome. 65 G None No Power Seat 65 G is a standard Economy Class seat. The proximity to the galley and lavatory area might be bothersome. 65 H None No Power Seat 65 H is a standard Economy Class seat located in a last row of the aircraft. Seat back recline might be limited due to the wall of the lavatory directly behind. Also, if the seat back in front is reclined, then personal space will be reduced. The proximity to the galley and lavatory area might be bothersome. 65 J None No Power Seat 65 J is a standard Economy Class seat located in a last row of the aircraft. Seat back recline might be limited due to the wall of the lavatory directly behind. Also, if the seat back in front is reclined, then personal space will be reduced. The proximity to the galley and lavatory area might be bothersome. 65 K None No Power Seat 65 K is a standard Economy Class seat located in a last row of the aircraft. Seat back recline might be limited due to the wall of the lavatory directly behind. Also, if the seat back in front is reclined, then personal space will be reduced. The proximity to the galley and lavatory area might be bothersome. 66 D None No Power Seat 66 D is a standard Economy Class seat located in a last row of the aircraft. Seat back recline might be limited due to the wall of the lavatory directly behind. Also, if the seat back in front is reclined, then personal space will be reduced. The proximity to the galley and lavatory area might be bothersome. 66 E None No Power Seat 66 E is a standard Economy Class seat located in a last row of the aircraft. Seat back recline might be limited due to the wall of the lavatory directly behind. Also, if the seat back in front is reclined, then personal space will be reduced. The proximity to the galley and lavatory area might be bothersome. 66 G None No Power Seat 66 G is a standard Economy Class seat located in a last row of the aircraft. Seat back recline might be limited due to the wall of the lavatory directly behind. Also, if the seat back in front is reclined, then personal space will be reduced. 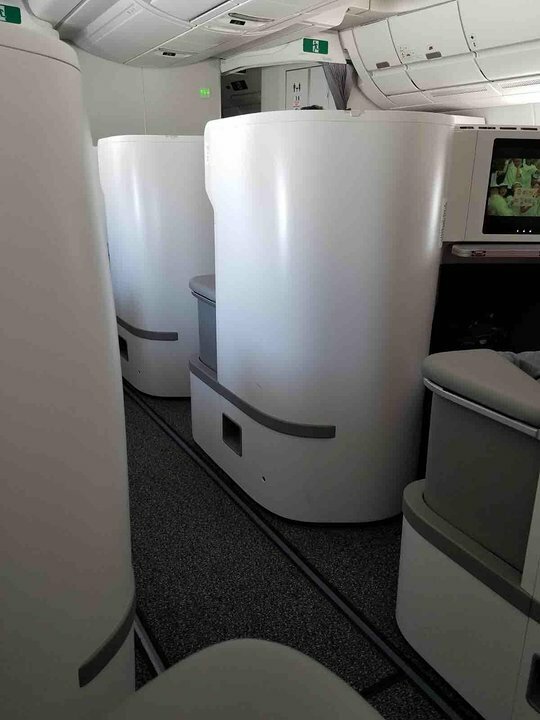 The proximity to the galley and lavatory area might be bothersome. Multiple selections of classic, Chinese, current, documentary, and other international films plus a variety of television programs are available for viewing. Also included in the selection are several video games. Monitors on the A350-900 also have access to selected live television news and sports channels. 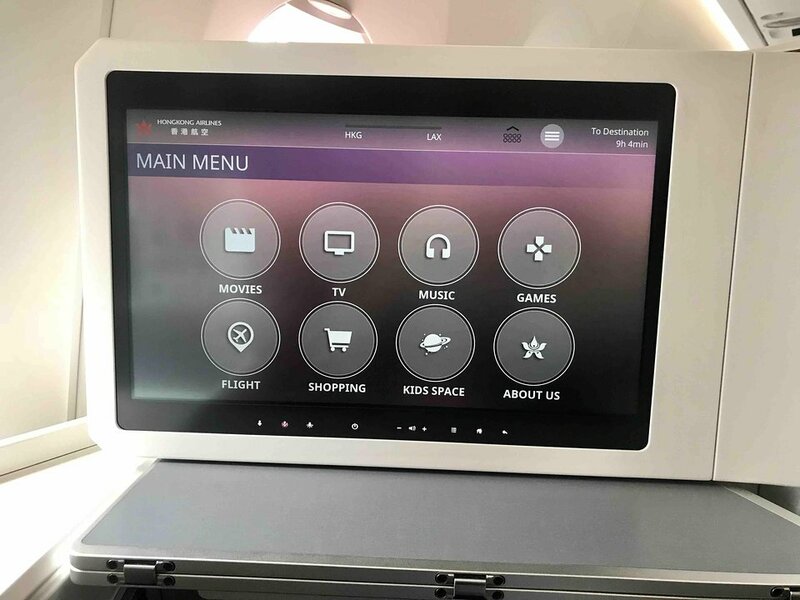 All video selections are displayed on each seats' inflight entertainment monitor. Every seat on this aircraft has access to an AC power port/outlet. Wi-Fi is available for access on the A350-900 aircraft. A fee for use applies. Hong Kong Airlines Airbus A350-900 aircraft operates on long-haul flights trans-Pacific flights. 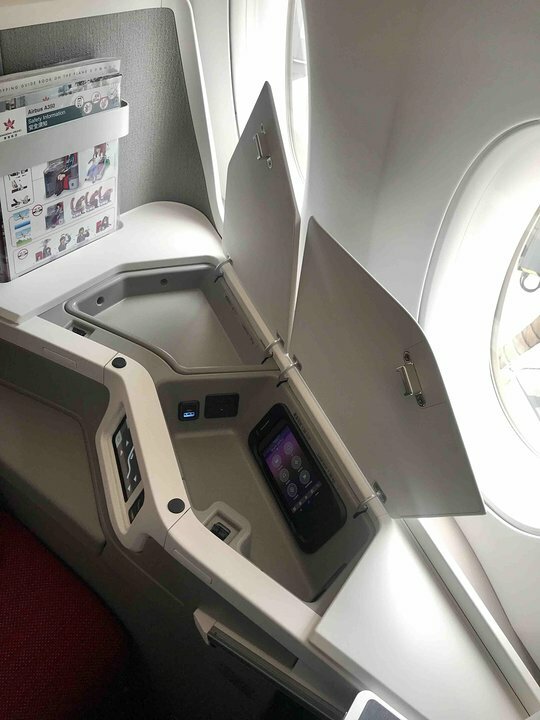 The aircraft is configured with 33 Business Class seats that transform into fully-flat beds and 301 standard Economy Class seats. Business Class seats are configured in a 1-2-1 arrangement. A separate section named Economy Comfort offering seats with additional legroom and Extra Legroom Seats, also offering additional legroom, are available for selection for an additional fee. Pretty good legroom and width on HX's 350s. Wonderful flight even though it's a middle seat. Hong Kong Airlines flies 1 versions of Airbus A350-900.